We take a short break from watches, having covered all the watches shown in SIHH2013 that interest me. 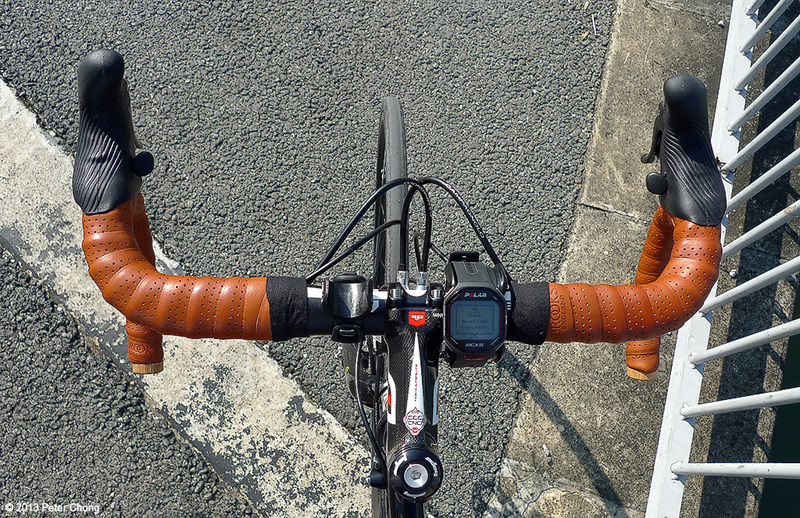 And return to my bike photographs...a developing interest due to my interest in cycling. Today's feature is my new cyclocross bike...built carefully with lots of research. I originally wanted a titanium frame, but an unpleasant incident with Lynskey caused me to rethink, and I decided to go the steel is real route. 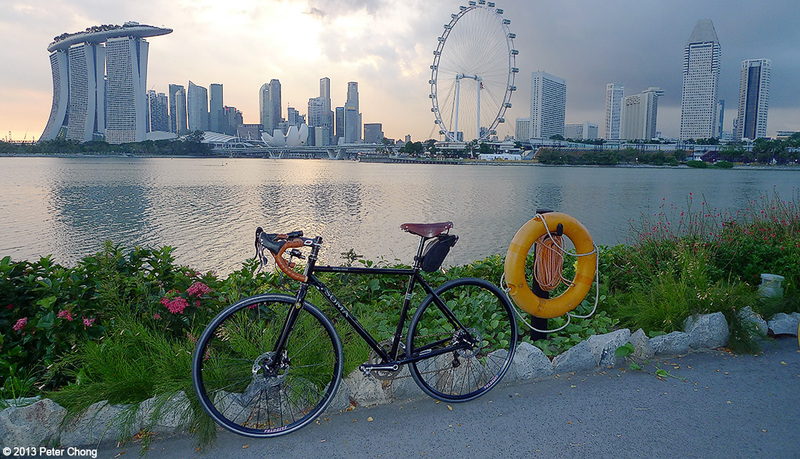 The final plan I guess is still to return to a custom titanium frame, but to try out the concept of using a cross style bike for go everywhere riding, including pacelines, group rides, PCN and a bit of light touring, a steel frame is an inexpensive place to start. I knew I wanted disc brakes, and the ability to put on panniers and fenders, and for the forks to be able to run fat tyres, up to 38mm, though I would probably run them mainly on 28 or 32. The search narrowed the candidates to Salsa, Surly and Soma. While the Surly Long Haul Disc Trucker is a champion tourer, the geometry is too touring for my liking, and I didn't really like the looks. The Salsa Doublecheck is a strong candidate, but I didn't like the fact that Salsa would not divulge what kind of tubes they use to make the frame. Whilst, Soma proudly proclaims the tubing is Tange Prestige, double butted. 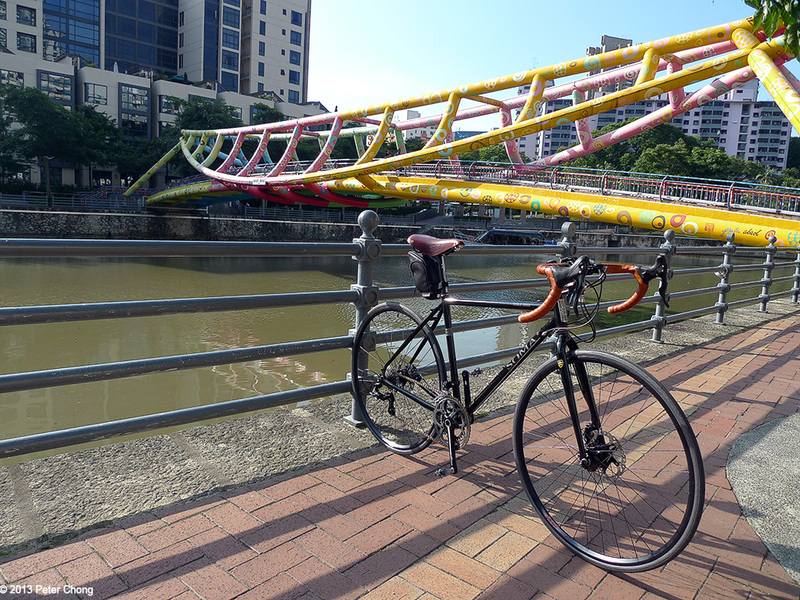 While welding is done in Taiwan, as is the Tange factory now, I understand, I find the welds flawless and the paintwork very nice indeed. Not Baum, or even Pegoretti nice of course, but nice enough. The gold chain is from Ti-N, titanium nitride coating which according to KMC who makes the chain, shifts smoother and lasts longer. 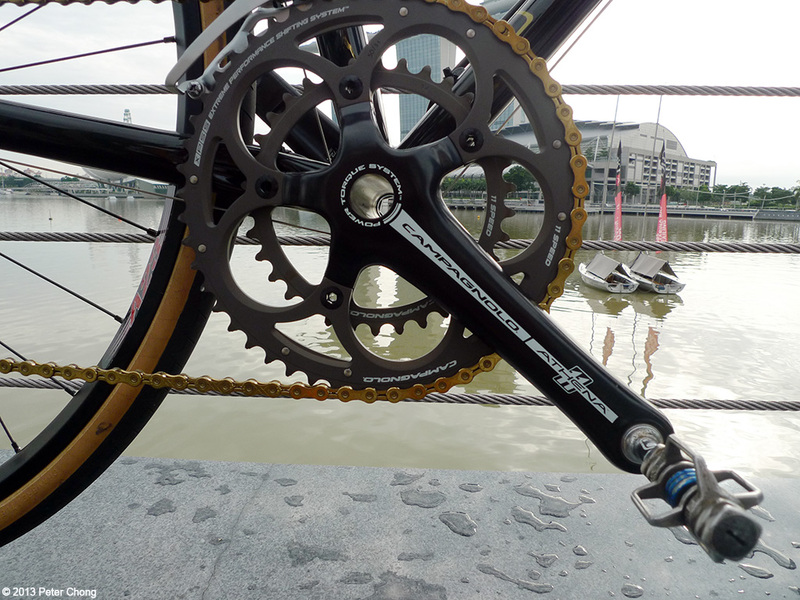 I chose this instead of the standard Campagnolo 11 speed chain because it also features a missing link chain breaker, allowing one to remove and reinstall the chain with a chain breaker tool. The component set was easy to decide. Campagnolo, of course. And the highest level groupset with alloy components is the Athena 11, so that was decided. 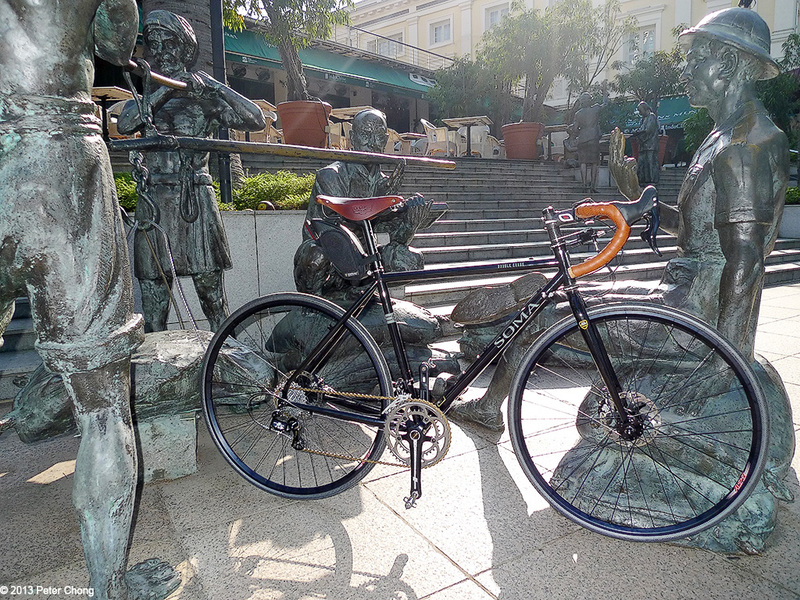 I also rode the Athena 11 on the Zullo MaxSilenus, and it was a superb groupset. The Hope V-Twin uses conventional cables from the shifters into this small hydraulic master cylinder, shaped like a V, hence the name. From this master cylinder, hydraulic lines carry the brake control over to Hope's proven X-2 brake calipers. 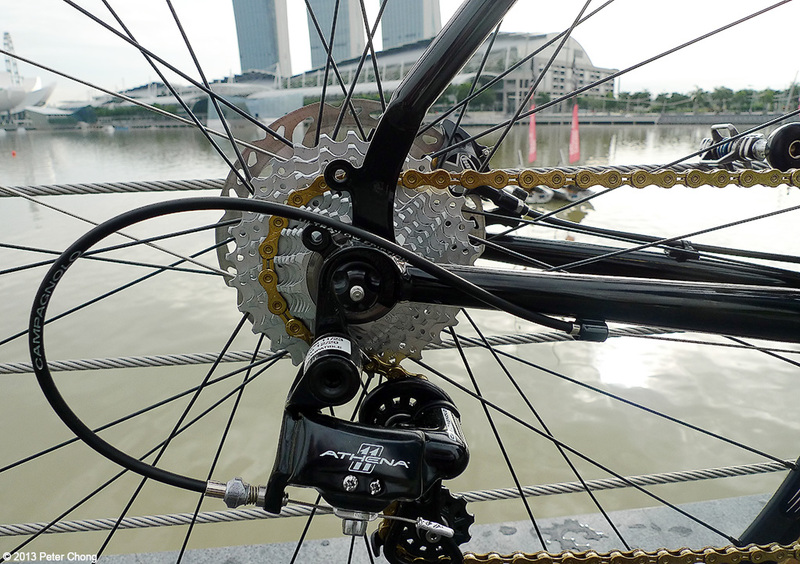 Very powerful brakes, with superior modulation. For braking, I decided to try out the new hydraulic braking offered by a few vendors for drop bar configured bikes. I originally wanted the TRP Parabox, but my bike builder...who did the fantastic build job, recommended Hope, and the V-twin looked fantastic, was used in the Aston Martin bike built by Factor001, so I went for it. The rotors are Shimano IceTech 160mm for both front and rear. The wheelset, which is actually the second most important component in a bicycle after the frame selection...though less glamourous than the grouppo was also rather easily selected. I had the Ambrosio Nemesis, the Stan's XTR and Velocity A23 as final candidates. Again, the input from Patrick the bike builder swayed me towards the A23. Hub choice was a bit easier to decide, as there were only 2 candidates offering 11 speed Campy freewheel with disc brakes. Chris King's told me they would have an offering by mid year 2013, but when I started the build, nothing was available. So it was either DT Swiss or White Industries. I decided to do White because of the excellent feedback, and also DT Swiss needed an adapter, while the new CX11 rear hub from WI was engineered specifically for Campy 11 speed discs. For the front, I used the WI MI6. Spokes were Phil Wood spokes laced 3x on the 32 hole rims/hubs for a very strong wheelset. The rest of the components also fell in place easily...I didn't want any carbon components, so alloy only. I selected 3T for the bars, as I love the feel of their Ergonova. To match, it was 3T for the stem...100mm. In the pictures, I have the MOST 100mm stem, a carbon lightweight one from a friend as I am waiting for my 3T stem to arrive. And the 3T seatpost to match. 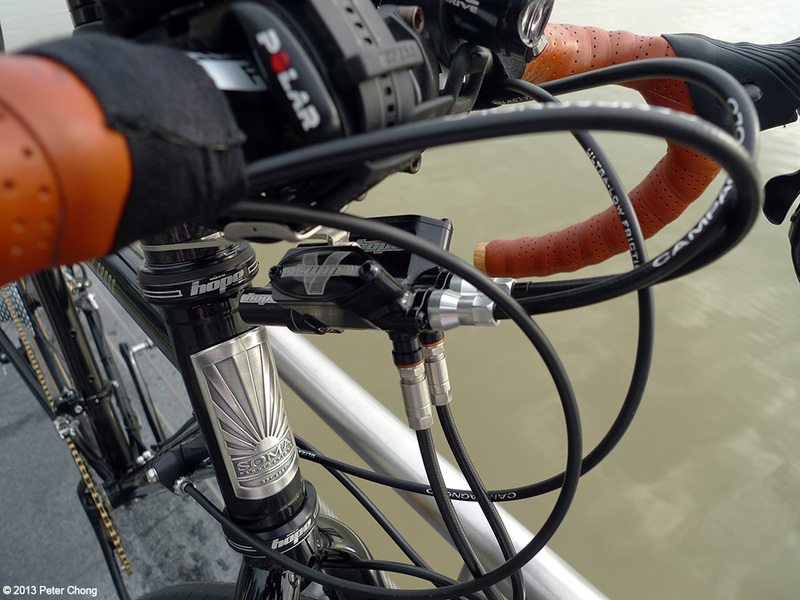 Headset, seatclamp and skewers are all Hope. 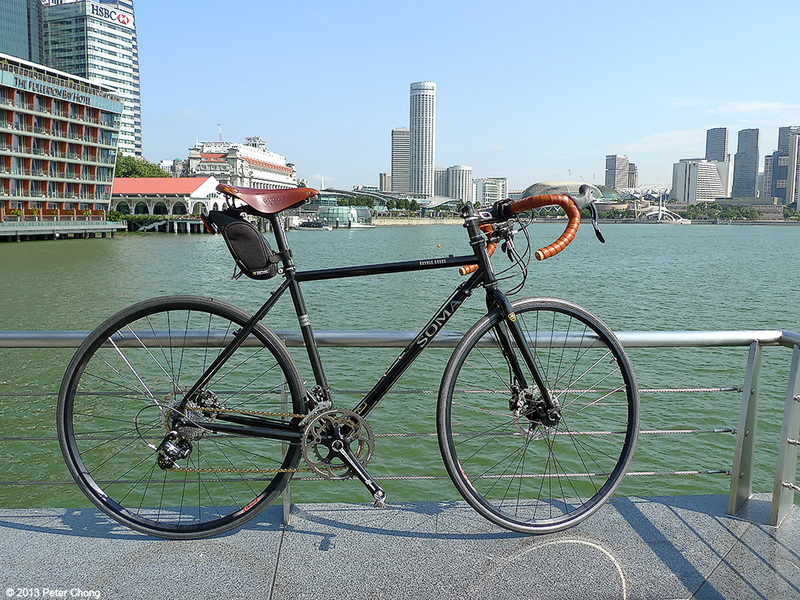 Brooks leather was used as bartape as well as an older B17 saddle pressed into service to complete this build. Tyres on the bike now is the Panaracer Stradius Extreme. 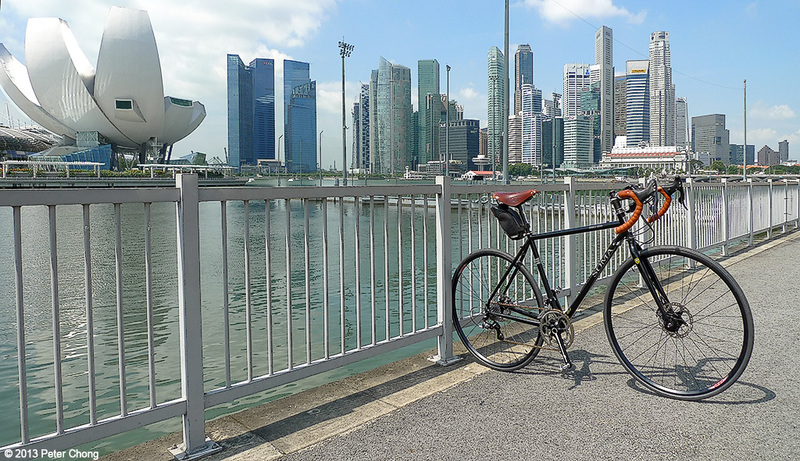 In some of the pictures, I had an old, tired Panaracer with brown sidewalls, which promptly punctured in the first ride. So these were swapped out for the Stradius Extreme. I also have on order Continental Gatorskin 32...though the Grand Bois Extra Leger 32 is calling my name. I will try these later. The Stradius Extreme are supposed to be 23mm race tyres, but on the Velocity A23 rims, they actually measure 26mm at 110psi pressure. Very comfortable, even at 110psi. Nice, reasonably supple, but of course no match for the Baum's Veloflex Extreme tubulars, or the Zullo's FMB Competition CX Silk tubulars, both of those running latex tubes, whilst the Soma is running standard Butyl tubes. The tyres are slick, and grip in dry and wet is very good. How does it ride? My first ride out with the Soma, I couldn't wipe the grin off my face. The ride was ultra smooth. The bike was not as stiff, or fast as the Baum Coretto, a bike already featured in these pages, and cost 5 times more than the Soma. 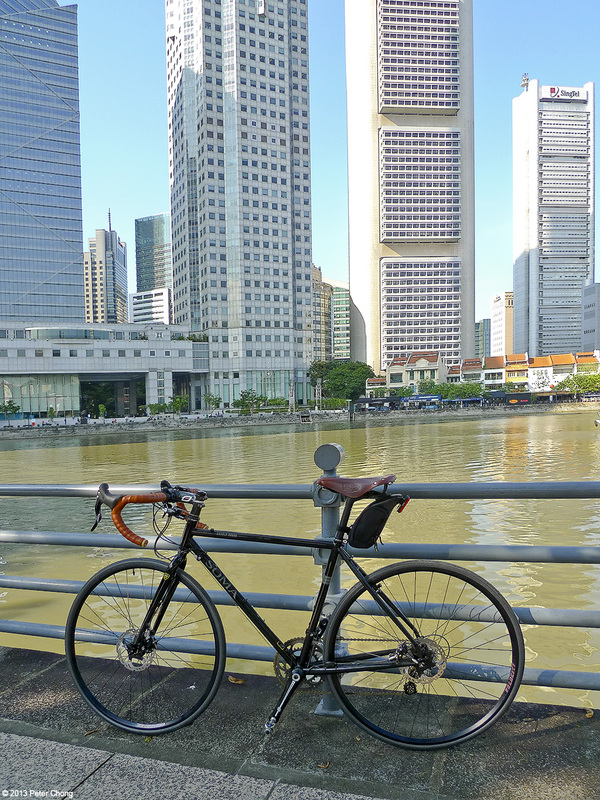 Though the Baum is titanium and the Soma steel, I find the Soma ride to be smoother. The White Industries hubs were also very smooth...as butter...albeit a lot more quiet than the Tune on the Baum. Now, coasting on the bike will not warn pedestrians ahead that a bike is coming...the Tune is very loud and one can do without a bell on the PCNs. The Athena 11 works like a charm...even coming from the superlative Super Record EPS 11 on the Baum, working the gears on the Athena was still fun...though changing from the small ring to the large ring takes a lot more effort than on the EPS. But considering the price differential, the Athena is better value for money. Love the bike and I am about to start a Soma Double Cross myself. Would love to make contact?